I’m pretty sure that most know that T-Mobile is the only major carrier over in the United States that doesn’t offer Apple’s iOS smartphone; however recently T-Mobile used an image of an iPhone in a marketing campaign that invited people with an unlocked iPhone to come over to the carrier. But apparently T-Mobile has now seen the light and decided to drop the iPhone image. According to the Wall Street Journal, the Marketing campaign by T-Mobile encouraged people with an unlocked AT&T iPhone to come over to the network and save 50-bucks on their smartphone bill, but according to TmoNews, T-Mobile sent out a memo stating the carrier could no longer use the iPhone image in their Bring Your Own Device campaign. 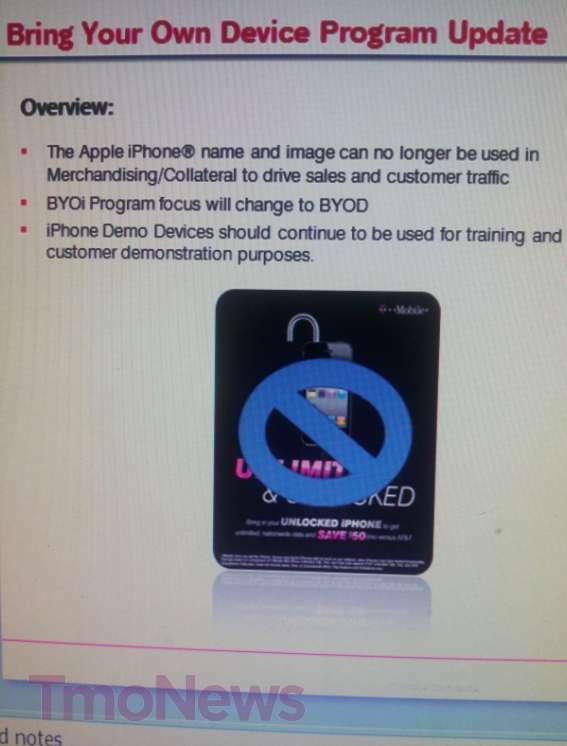 Apparently T-Mobile has decided to drop the iPhone image in favour of other AT&T smartphone pictures, however the program also features demonstrations iPhone units in stores, and that will not change according to a spokeswoman for T-Mobile. The spokeswoman also said that dropping the iPhone image was also a natural progression in the campaign, and only used the image last month so they could capitalise on the excitement surrounding the release of Apple latest iOS smartphone, the iPhone 5, and also commented that she is unaware of T-Mobile having any direct communication with Apple over the their marketing campaign. Word is when contacted about the matter spokespeople for both Apple and AT&T declined to comment on the subject, whilst the spokeswoman for T-Mobile stated that although the language seems strong, the intention was only to ensure sales reps switch out marketing material as per schedule. The iPhone will work on T-Mobile, although the smartphone doesn’t the same functionality like when running on AT&T due to frequency differences, and most iPhones on T-Mobile connect over a 2nd-gen network.